Kitchen remodeling is the number one renovation to add value and efficiency to your home. 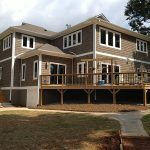 However, there are some common mistakes that people make while remodeling that hinder the purpose of effectiveness of your remodel. Below are some common mistakes to try and avoid during a kitchen remodel. Cabinets that don’t reach the ceiling- When you are renovating your kitchen, remember to not leave any space between the cabinets and the ceiling. It creates wasted space that is only good for collecting dust or clutter. Lack of counter space- It is common in a kitchen remodel to want to open up space. However, you need to remember the purpose of a kitchen, and you want to make it functional. Forgetting the golden triangle- In kitchen design, the golden triangle refers to the location of the fridge, stove and sink. These three things need to close enough to each other for functionality, but far enough away that it won’t create a traffic jam when more than one person is trying to help. Oversized island- Choosing to add an island is a popular choice when it comes to kitchen remodeling. However, you need to be sure its proportional to the rest of your space, as an island that is too big can ruin the flow and look of your kitchen. Poor lighting- Typically, rooms need three types of lighting: general, task, and accent. Kitchen designs often forget to add enough task lighting. Prep areas, the sink and stove should each have their own lighting in addition to the general kitchen lighting. Kitchen remodeling is not as easy task. There are a lot of factors that go into appropriately designing your kitchen, and it is often an overwhelming task for first-time home builders. At Chad Goodin Signature Homes, we will be by your side every step of they way, offering our advice, to ensure your kitchen is a room that will bring many memories for years to come.